Since purchasing the estate in 1975, Comte Henri de Saint-Victor and his son Eric have been producing some of the most seductively aromatic and nobly structured wines in all of Southern France. Perched atop the highest and northernmost part of the appellation, the Château commands sweeping vistas of the amphitheater of vines and the Mediterranean Sea. The restanques, or terraces were carved into the hill to minimize erosion and maximize water absorption, which is of the utmost importance in a hot, dry terroir such as this one. 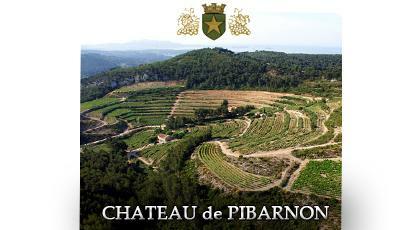 The soil at Château de Pibarnon is unique, differing from that of its neighbors further down the slope. As a result of a geological anomaly purported to have taken place at the end of the Mesozoic Era, Pibarnon's soils contain large quantities of blue marl and limestone, as well as fossil material which is 150 million years older than that found in other parts of the appellation. The dearth of nutrition provided by these stony, fossil-studded soils ensures that the vines achieve maximum vigor through their daily struggle to survive. While Pibarnon's flagship cuvée is a classic vin de garde which can take as many as ten years to begin to show all its glory, 'Les Restanques', made with 70% Mourvèdre and 30% Grenache, is styled for a lush texture and more immediate approachability. Not to be missed are the Bandol Rosé and rare Blanc which are also considered benchmarks for quality. Wine Spectator 91 "This has a singed juniper hint out front, followed by bay, olive and leather hints that pervade the core of lightly steeped cherry and raspberry fruit. Everything knits nicely through the medium-weight finish. Approachable, but will develop more nuance with a bit of cellaring.